Forget romance, fine dining or an epic boxset binge – new preliminary research reveals that driving a sports car on a daily basis is among the best ways to boost your sense of wellbeing and emotional fulfilment. The study measured “buzz moments” – peak thrills that play a vital role in our overall wellness – as volunteers cheered on their favourite football team, watched a gripping Game of Thrones episode, enjoyed a passionate kiss with a loved one or took an intense salsa dancing class. Only the occasional highs of riding a roller coaster ranked higher than the daily buzz of a commute in a sports car. 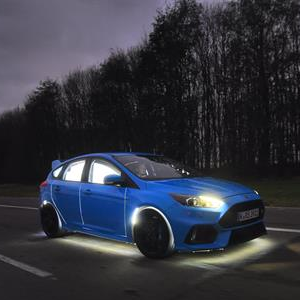 Working with neuroscientists and designers, Ford brought the research to life with the unique Ford Performance Buzz Car: a customised Ford Focus RS incorporating wearable and artificial intelligence technology to animate the driver’s emotions in real time across the car’s exterior. Study participants who sat behind the wheel of a Ford Focus RS, Focus ST or Mustang experienced an average of 2.1 high-intensity buzz moments during a typical commute; this compared with an average of 3 buzz moments while riding on a roller coaster, 1.7 while on a shopping trip, 1.5 each while watching a Game of Thrones episode or a football match, and none at all while salsa dancing, fine dining or sharing a passionate kiss. Researchers at the Ford Research and Innovation Center in Aachen, Germany are already looking into how vehicles can better understand and respond to drivers’ emotions. As part of the EU‑funded ADAS&ME project, Ford experts are investigating how in-car systems may one day be aware of our emotions – as well as levels of stress, distraction and fatigue – providing prompts and warnings, and could even take control of the car in emergency situations.